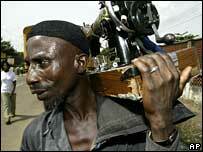 Nigeria is ranked as one of the most corrupt countries in the world. Daily, low-level corruption is visible on the street; policeman extorting money from motorists to supplement their meagre wages. But it is in the world of politics and government, where corruption has been most damaging. For decades the government has accrued huge oil revenues, yet the country suffers from a lack of basic infrastructure, and tens of millions live in poverty. At the same time, some politicians and their business associates have amassed personal fortunes. Although accusations of graft have long been a feature of Nigerian politics, as elections approach early next year, the politics of corruption have taken on a new powerful role. For the past four years, the fight against corruption in Nigeria has been embodied in the Economic and Financial Crimes Commission, (EFCC) and its Chairman Nuhu Ribadu - a 46-year-old senior police officer. 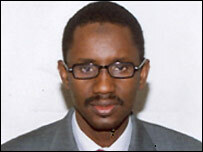 The agency has had some successes, and Mr Ribadu has been praised both at home and abroad. The EFCC says in the past two years it has recovered more than $5bn and has successfully prosecuted 82 people. It has taken on internet crime and fraudsters. It has gone after a former chief of police, a government minister and an impeached state governor. But despite highly publicised raids and investigations, when it comes to prosecutions, it is usually the lower level officials, businessmen and fraudsters who end up being convicted. In part that is because some political offices, such as state governors and the president, carry immunity from prosecution. But as election campaigns get under way, President Olusegun Obasanjo has declared that he will use all legal means to stop "criminals and crooks" from taking the reigns of power in Nigeria. In a recent interview, Mr Ribadu pledged to stop corrupt politicians running for office. "Things are improving marginally now. 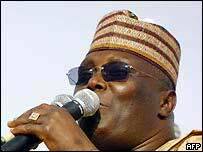 But if you bring somebody who is a thief, they will feast on this money and take Nigeria to what it was before." But the anti-corruption agency is persistently accused of only going after opponents of President Obasanjo, a charge Mr Ribadu denies. As elections approach, new EFCC investigations and the accusations of political bias, are coming thick and fast. Perhaps in response, the agency recently raided the offices of the new Nigerian corporation, Transcorp, which has close links to the president. But one raid is unlikely to satisfy the critics. Privately, supporters of Mr Ribadu say he is going after those he is allowed to, while building up dossiers on others who, for now, are "protected". The latest and most serious contender to be scrutinised is Vice-President Atiku Abubakar, who fell out publicly with the president when he opposed the campaign to allow Mr Obasanjo to run for a third term in office. The vice-president is one of the leading candidates for the top job in next year's elections, but in a recent report by the EFCC, he is accused of fraud involving more than $100m in public funds. An accusation he flatly denies. He says he is the victim of a political conspiracy. 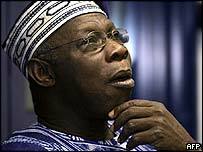 President Obasanjo used the report to form an Administrative Panel of Inquiry, consisting of a number of government ministers to indict the vice-president. Crucially, under the constitution anyone indicted by an Administrative Panel is barred from running for high office. If this tactic is pursued, the legitimacy of the president's panel looks set to be the subject of a fierce legal battle. Some of the vice-president's supporters have said they will present evidence of corruption by the president, if he persists with the campaign against Mr Abubakar. More generally, a lot will depend on the government-appointed electoral commission, which has the responsibility of screening candidates and deciding if they are technically allowed to stand. If they decide to bar any of the big candidates from the race, either at the state or national level, there is the risk it would provoke violence. This would be particularly dangerous in a country, which after decades of military rule, is struggling to keep ethnic and religious divisions in check. Talking to people on the street in Lagos, many are supportive, and wryly amused by the idea that the top politicians would disqualify themselves by accusing each other of corruption. People are desperate to see Nigerian politics cleaned up and very few politicians are considered to be clean. Ultimately that is the real dilemma. In a country where corruption is seen as endemic, an anti-corruption campaign used selectively as a political weapon is likely to provoke a bitter fight amongst the political elite. And that in turn, could impact on Nigeria's pre-election stability.